St. Comgall's Youth Club is a voluntary youth provider open to all young people across Antrim aged 8-25 years, providing programmes and activities focusing on the personal, social, physical and mental development of the young people whilst working to increase the level of young people’s participation throughout their communities. Programmes and activities include youth work training, creative arts, sports and outdoor play, health and well-being, and life-skills programmes. St. Comgall's applied to the Foundation for financial support towards the “Growth Project” to allow young people to engage in youth work provision through the medium of outdoor pursuits. 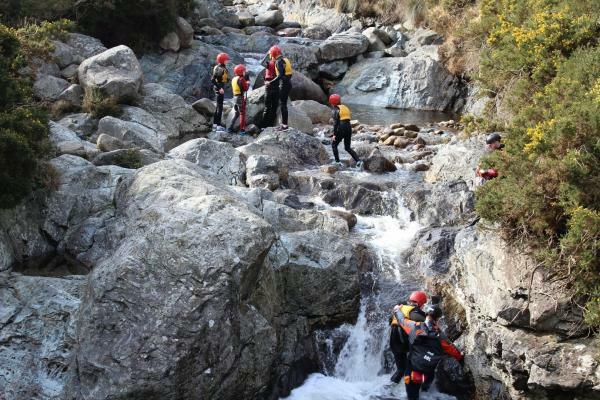 This involves young leaders receiving accredited training in youth work, orienteering, hillwalking and kayaking, allowing them to coach younger members. The group was awarded £4,070 in June 2015 and this was able to help with youth leader costs, training, activity, residential and transport costs, and new outdoor equipment. Over the course of the project, 25 young people achieved the OCN Level 1 Youth Development. These young people, aged 14+, then delivered small projects to 6 - 8 members across the club in various outdoor education programmes such as night walking, map reading and orienteering skills. 12 volunteers and young people completed and attained qualifications in First Aid and 12 volunteers and young people completed and attained qualification in Basic Food Hygiene Level 2. Additionally, one Adult Leader completed Walker Leader Training for the Community and one Adult Leader completed Outdoor Hill Walking with Education for young people accreditation.